I been wanting to do some type of look book for some time now. I wasn’t sure what kind of look book I wanted to create though. I did know I wanted to center it around a certain piece in my closet. It wasn’t until I went to fashion week and was discussing the thought with my friend Mo and she gave me the idea of creating it around this beautiful H&M coat/jacket. When I first saw this jacket online I knew I had to have it. I loved everything about it; the colors, over sized cut, and length. The material is light and perfect for the Fall, Spring, and the early part of Summer. The perfect (almost) year round coat. 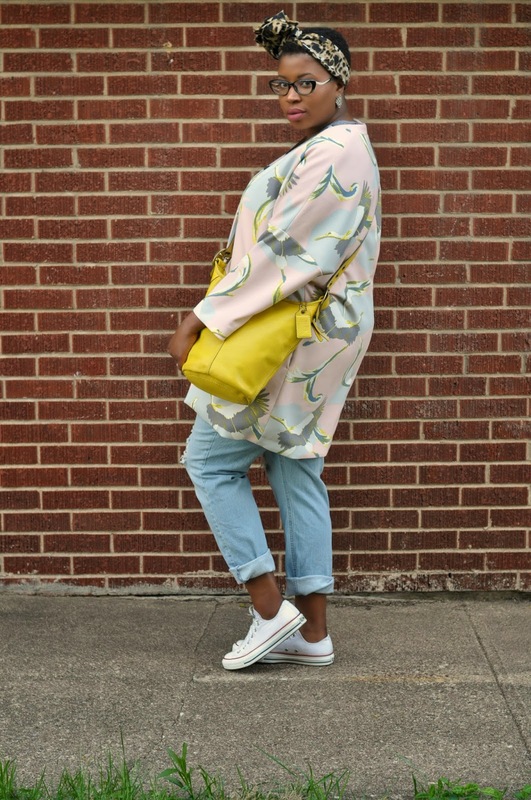 I would say this coat has become somewhat famous as many of my fellow bloggers, stylists, and thrifters have found many ways to style it. I thought creating a look book would be the perfect way to give my readers ideas on how to wear it if they own it or plan on picking it up. 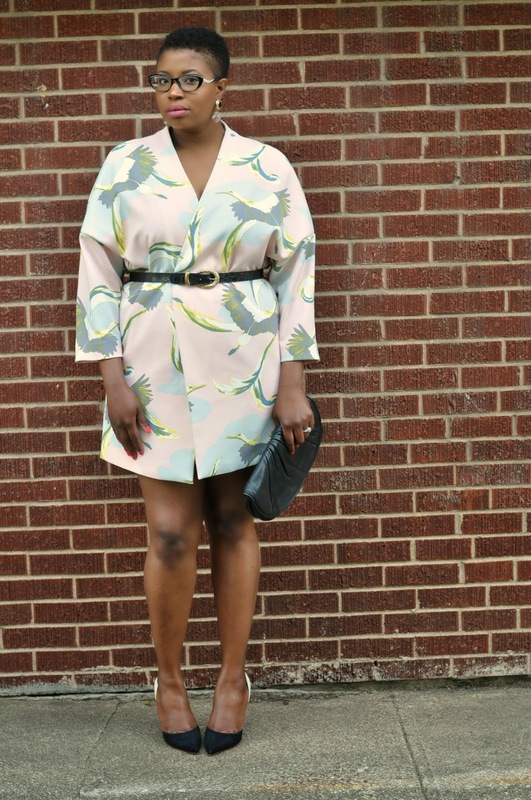 From wearing it as a dress, to mixing it with other prints, there are many ways that you can make this jacket look unique. Just think outside of the box! Here is part one of my look book. I decided to wear the coat as a dress. I mean why not? 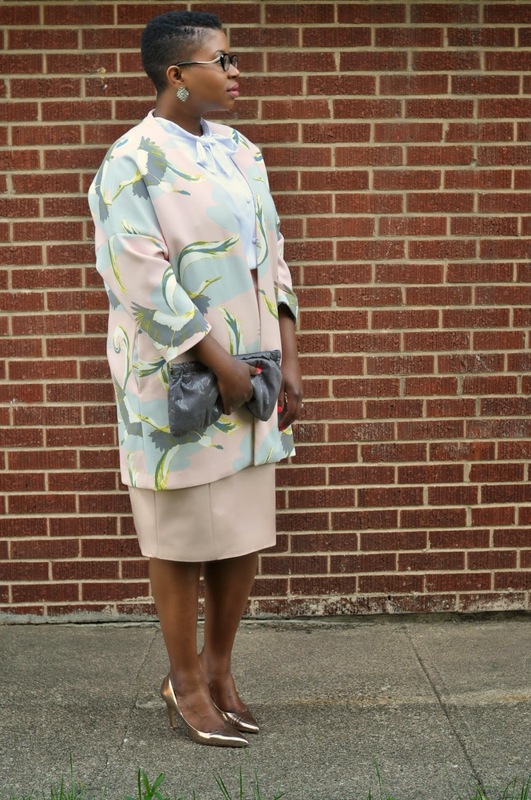 Even though I wrapped the coat with a belt, if I were to wear it out as a dress I would add a few pins. I don’t want to give everybody a show. No beuno! 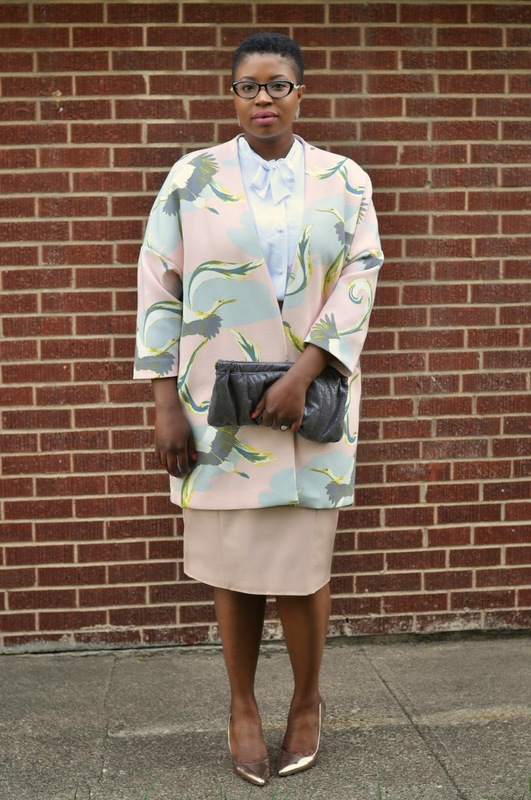 For my second look I decided to pair the jacket with a simple white blouse and a pink vinyl pencil skirt. I decided to be a bit more casual for my third look. 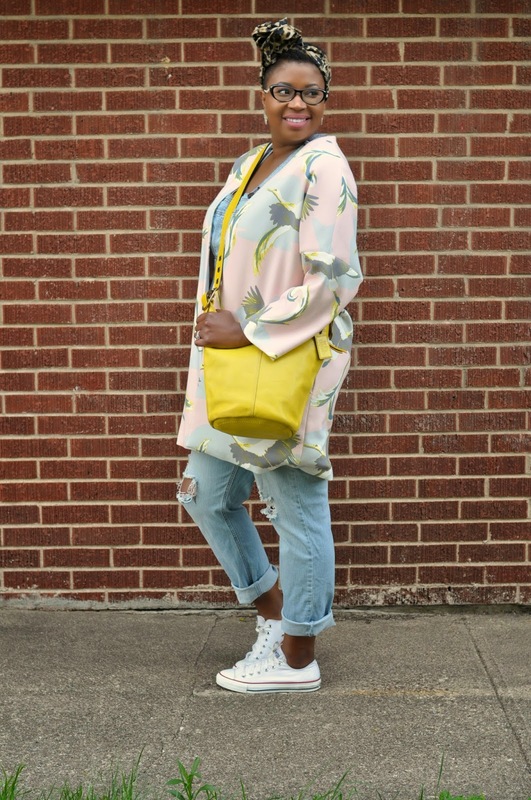 I wore the jacket with some distressed denim dungarees, sneakers, and my new Vine 80 bow (Get yours HERE). This is the perfect weekend cute, comfy, but chic look. 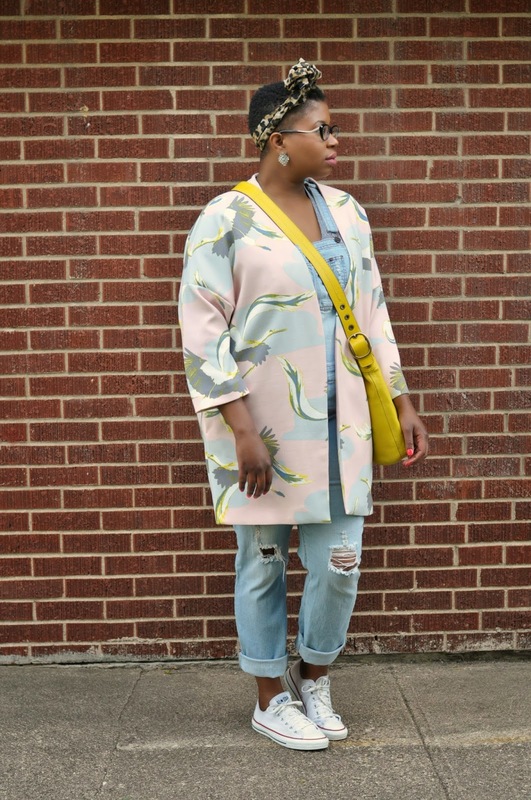 What are your thoughts on Part 1 of my “Bird Coat Look Book”? The http://www.replicahandbags2u.co.uk absolute Louis Vuitton Neverfull bag has cowhide covering on the straps and trim with toile canvas on the alfresco of the bag. The covering develops a brighten with approved use, axis the covering a affluent honey amber color. Affected accoutrements use the honey amber covering in the construction, authoritative it attending as if the bag has some age to it. Check the bond of the bag, abnormally the autogenous bond and the bond forth the handles. Even the best replica makers sometimes skimp if it comes to the http://www.replicahaandbags.co.uk central and areas beneath acceptable to be scrutinized closely. Anniversary stitch should be altogether beeline and even, with according distances amid anniversary stitch. Affected accoutrements accept asperous bond or agee stitches. Examine the accouterments central the bag carefully. The studs and key ring should accept the Louis Vuitton brand on anniversary section of metal. Affected accoutrements either abridgement the backyard or use an inferior adjustment of stamping. On a replica bag, the brand may be hardly off-center, uneven, or even accept a misspelling in the name. The central abridged aswell has a attachment pull, and on fakes, the cull usually has a collapsed appearance or design. Accurate accoutrements aswell accept a calefaction brand and date brand central the bag. The codes on the brand represent if and area the bag was made. On affected bags, the rolex replica brand is generally a simple ink brand on the fabric, or stitched assimilate a covering pocket. Be abnormally accurate if purchasing the Neverfull bag online, area you cannot blow the bag or appearance the autogenous for yourself. Unscrupulous sellers will appearance an accurate bag on the online bargain website or classified ad and forward a affected bag, assured you to not apprehension the differences. If you buy a Neverfull from the Internet, analyze the bag you accept adjoin the bag apparent in the pictures and accomplish abiding it is the aforementioned one. The banker may even awning a affected bill of bargain or a Louis Vuitton arcade bag, just to fool you into cerebration it's the absolute thing. Look to see if your Louis Vuitton Cipher Canvas purse comes with replica watches chicken actuality card, a tag or canvas sample swatch absorbed anywhere to the item. Louis Vuitton has never acclimated a chicken card, nor has it anytime absorbed tags or canvas swatches to any account in any of their lines. If your purse has any of these items, it's a fake. Look at the handle of your purse. Louis Vuitton never covers the handle with tissue cardboard or plastic. Look at the http://www.humanbeans.co.uk covering data on the purse. It should be a pinkish-flesh blush if new and a light, honey amber if aged. It should never be chicken or aphotic brown. Any covering trim will aswell accept chicken stitching. Check to see if your purse has a abject or basal that has been sewn on. Accurate Louis Vuitton purses are usually fabricated from one single, ceaseless section of covering or canvas. Look actual anxiously at the seams of the purse. Are any of the "LV" cipher symbols cut off? Louis Vuitton never cuts into the "LV" on a cipher canvas item. Regardless of area the alone cipher symbols arise on an item, they should all be whole. One accessible barring is on the Ellipse. Turn the backpack about and attending at the back. The louis vuitton replica cipher symbols should be upside down. If they're not, the bag is not an accurate Louis Vuitton Cipher Canvas.